Over the long weekend I was sick, sick, sick. And to top it off my Kindle TV was not working (which a whole different story), so I had to plug in the old Roku which would only stream my Netflix Family account (because that is the default). So, I was limited in what I could watch . . . so I picked the first thing that sounded remotely interesting, and happened upon "When Calls the Heart." Am I completely in love with this show? Yes, I think it is safe to assume at this point that I am completely in love with this show. 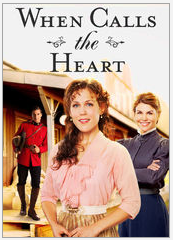 It is about a wealthy heiress, Elizabeth, who travels out "West" (in this case Western Canada) in order to be a school teacher in a mining town. Set in the early 1900s, the show just captured my heart. There is also a mountie, the school children, and mining widows as the main characters of the show. The show reminds me of Lark Rise to Candleford (if you have not seen it, another fantastic show), or even a little like Anne of Green Gables. It is heart-warming, charming, and enchanting.